Well, hello there again, Neighbor! The hustle and bustle of Christmas is over and we want to share a little of what we did over the holidays with you. It was a busy time for us, thanks to you, because we had plenty of gifts and food and household items to share with our Indian brothers and sisters. Thank you so much for all that you did to help and I want to encourage you to “keep up the good work” because the need doesn’t go away after the holidays. There are some desperate places on the reservations that we go to where your help is needed and vital. For the Christmas season, we made 5 trips with goodies for the kids and food and mattresses for the adults; two trips to Celilo Village, one trip to Fort McDermitt, Nevada, one trip to Northwest Indian Bible School at Alberton, Montana, and two trips to St. Ignatius, Montana. I tried to include pictures from each trip, but ran out of room, so I hope what you see gives you a feel for what was accomplished during November/December. Again, we couldn’t have done any of it without your prayers and financial support so we want to thank you from the bottom of our hearts. We are blessed to have teammates like you who have a heart for our Native brothers and sisters. Only Heaven will reveal all that your “time, talent, and obedience” has accomplished on the reservations of America. Thank you, Neighbor! We are looking for a vehicle for Sylvester Knows His Gun now. Sylvester wrote to us expressing his need and we are anxious to help him. He travels around ministering to his people with song and testimony so he needs a reliable mini-van or 4 wheel drive pickup ( a small one) because he travels in ice and snow during winter months. Sylvester has been a friend to this ministry for many years and we believe God will provide the need. The Lord willing, at the end of March or beginning of April, we will meet with our mid-west workers and a group who wants to provide food and the Gospel on the Pine Ridge Rez, to have a “get-to-know-you” and set up a system for delivering food without the Portland office having to be there. We also want to tie in our “big 5” trip at that time. That’s where we pick up clothing and household items from Plevna Baptist, Ekalaka Bible Church, Hettinger Assembly of God, Bowman Assembly of God and Scranton Lutheran Church and deliver it to our “point people” on the way home. Our point people are ones we have worked with for years and know we can trust them to deliver the goods to people in need in their areas. Thank you again, for making this all possible. We pray the Lord’s richest blessings on all of you and remember, like the old song says, “don’t put off ‘til tomorrow what you can do today, for your tomorrow may be today”. Do you have our new email address? What a blessing to be working with Tim Whiting and Dan Russo! These men OF God, who were sent to us By God are filling a huge gap in this ministry. Tim, who has loading docks and loading equipment, and Dan, who drives big rig, are helping us take big loads out to the reservations that we minister on. With a great reduction in fuel costs and without having to pay for insurance and maintenance, we are able do more with the money God (and YOU, Teammate!) are supplying. We want to be good stewards. 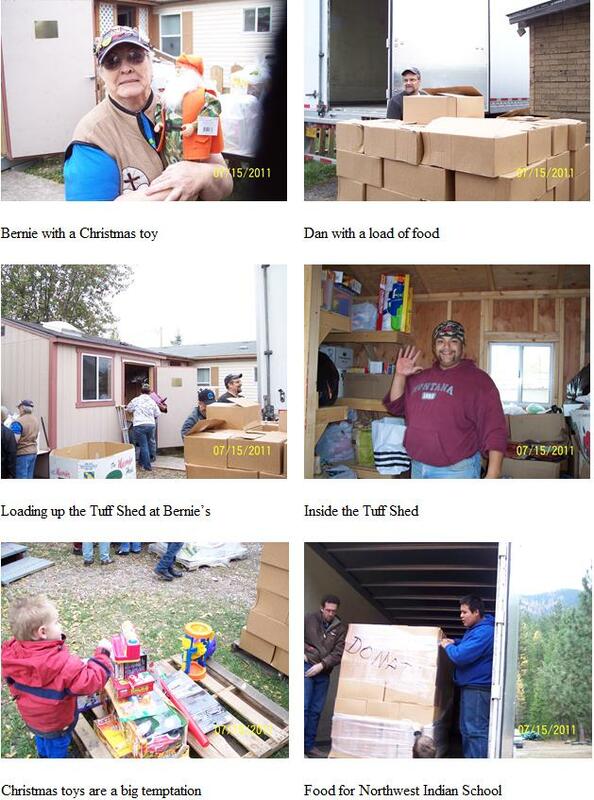 After loading the Wells Cargo and Dodge Ram, Jeff Phipps and Bob King headed out with food, apples, mattresses, toys and clothing for St. Ignatius, MT to supply the shed at Bernie’s that was supplied by the Bridal Veil Church Community Church. Then, shortly before Christmas, Les Phipps and Dan Russo made another trip to Bernie’s with the big rig. 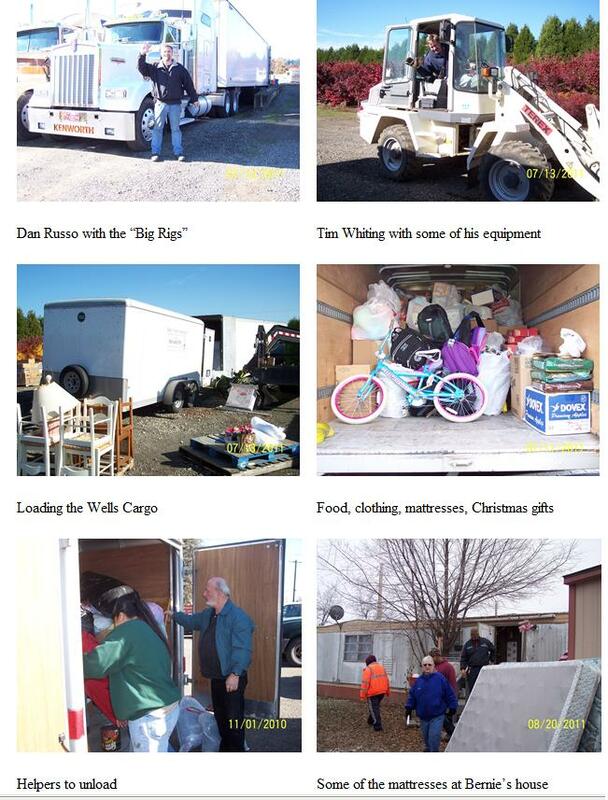 After dropping off more mattresses, Christmas gifts, food, and clothing, they headed for Northwest Indian Bible School, where they dropped off MORE food, mattresses, and Christmas gifts. Thank God for Tim and Dan’s big rig! We can really do a lot of good with just one load. What a privilege to help this school that is training Indian youth for the ministry. No one can reach Natives with the Gospel as well as another Native; thank God for this school! 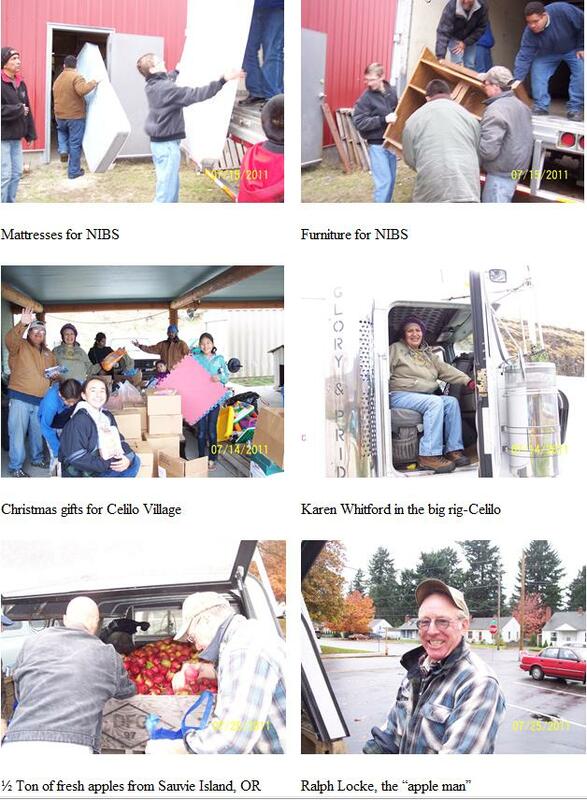 We also made a trip to Celilo Village with refrigerators from Standard Appliance and Christmas gifts for the kids. What a joy to see their faces as we gave them much needed items. Then we called Northwest Indian Bible School to see if they would like any mattresses. We were told that just that week one of the dorm mothers had reported that the mattresses they had were “shot”. Isn’t that just like the Lord? To supply the need before we can even ask for it, praise His name! We were so happy to tell them we had mattresses AND food to bring to the school and this was a chance for Dan Russo to get to know these fine people. We also want to give a “shout out” to Ralph Locke from Sauvie Island, Oregon. This wonderful Christian Brother brings us apples from his farm to give out on the reservations. We don’t realize what a treat a fresh apple is to the kids who rarely get to eat fresh fruit and vegetables on mid-west and south-west reservations. 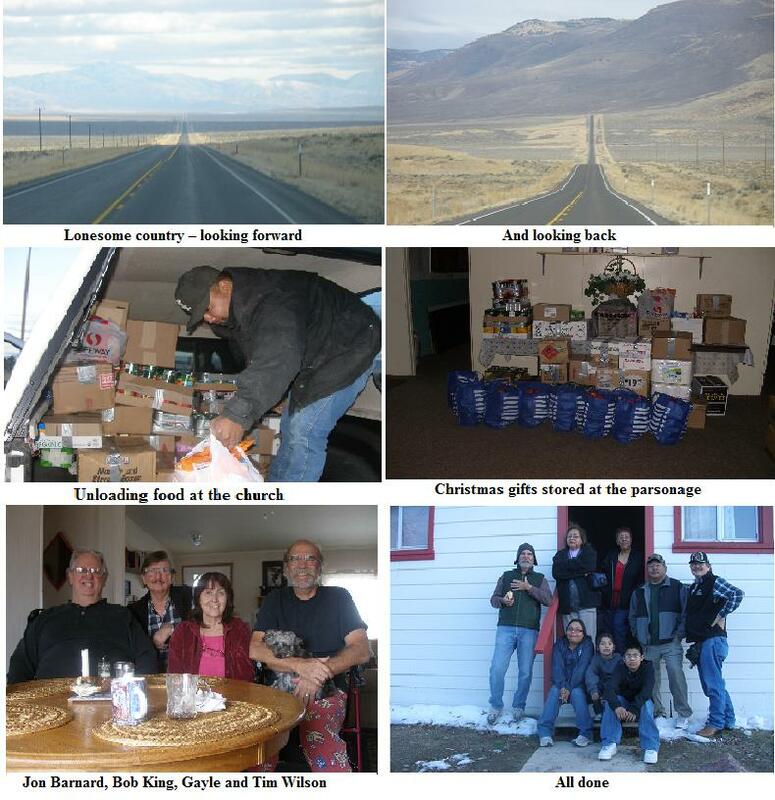 Bob King and Jon Barnard headed out for Nevada to deliver food, fresh apples, and Christmas gifts to the little group of people at Fort McDermitt. Once over the snowy pass, the roads were good the rest of the way. They met with the new pastor and his wife, Tim and Gayle Wilson, at the New Life Center and after visiting for a while, called our old friend, Ernestine Coble, and some other helpers to get started unloading. What a wonderful time of fellowship and how surprised they were to see the Christmas gifts! They weren’t expecting them and they told us there were “just enough” for the kids. We serve a God who always provides “just enough”, praise Him! Another year is dawning, Dear Master, let it be, in working or in waiting, another year with Thee. Another year of mercies, of faithfulness and grace; another year of gladness in the shining of Thy face. Another year of progress, another year of praise; another year of proving Thy presence all the days. Another year of service, of witness to Thy love; another year of training for holier work above. Another year of dawning, Dear Master, let it be on earth, or else in Heaven, another year for Thee. Friendship isn’t about who you have known the longest, it’s about those who came and never left your side. Joy isn’t the absence of troubles, but the presence of Christ.